Earlier this week, the United States Mint sold out of the 2009 American Gold Buffalo Proof Coin. The coins are struck in one ounce of 24 karat gold and feature James Earle Fraser’s classic Buffalo Nickel design. The 2009 Proof Gold Buffalo went on sale at the US Mint on October 29, 2009, priced at $1,360. The first available US Mint sales report indicated that an impressive 19,591 coins were sold within the first three days. The pace of sales slowed in the following weeks and continued into the new year. As total sales approached 50,000, this Coin Update News article suggested that the coins were close to a sell out. This prediction turned out to be on the mark, with the US Mint officially announcing the sell out on March 29, 2010. Prior to the sell out, the coins were last available from the US Mint priced at $1,410. The US Mint has offered a proof version of the American Gold Buffalo since 2006. For the inaugural year of issue, the Mint set a maximum mintage of 300,000 coins and imposed an initial ordering limit of ten coins per household. Final sales for the 2006 Proof Gold Buffalo came in at 246,267. The following year, the 2007 Proof Gold Buffalo was offered with a maximum mintage of 200,000 coins and an initial ordering limit of 100 coins per household. The final sales showed a sharp decline from the prior year with 58,998 coins sold. For 2008, the US Mint vastly expanded the collectible offerings for the American Gold Buffalo to include both uncirculated and proof versions across one ounce, one-half ounce, one-quarter ounce, and one-tenth ounce sizes. Each coin was offered individually or as part of a four coin proof or uncirculated set. There were no maximum mintages or ordering limits imposed. 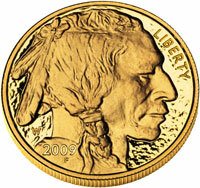 The one ounce 2008 Proof Gold Buffalo sold 18,863 coins across individual and set options.